How abrasive is this? Application process? I know what is intended for but just thinking, would this be acceptable to do in place of wet sand? Or way to abrasive? Application is usually with a scuff pad (Scotch Brite kind of thing) in varying degrees of aggressiveness - often a personal preference sort of thing. The idea is to clean and scuff a surface so that it gives a fresh coat of paint some bite onto that surface. Think of a spot repair on a panel, a hood for example: once the spot is repaired (a little hammer and dolly work, maybe a touch of filler) you can't just paint that spot, you generally have to paint the whole hood. But you don't strip the entire hood before paint, so you need to scuff the remaining "good" paint in order for the respray to take hold. That's where this comes in as it both cleans the existing paint and gives it just enough of a rough up to accept the new paint. 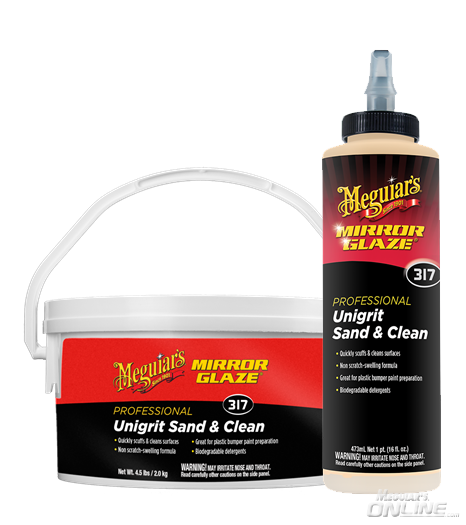 It's a lot less expensive than using up sanding discs all the time, plus it saves a step by cleaning while scuffing. Overall finish is not going to be as nice as a proper wet sand job, but that's not as critical since enough paint will be sprayed over it that you'll never know. What is the application process on this? Let's say I wanted to prep a large panel, or even a whole car for new paint. Traditionally, I'd use a DA with sandpaper to scuff the old finish. Can I apply M317 with a buffer? A DA with a microfiber pad? Foam? A rotary with a wool pad?